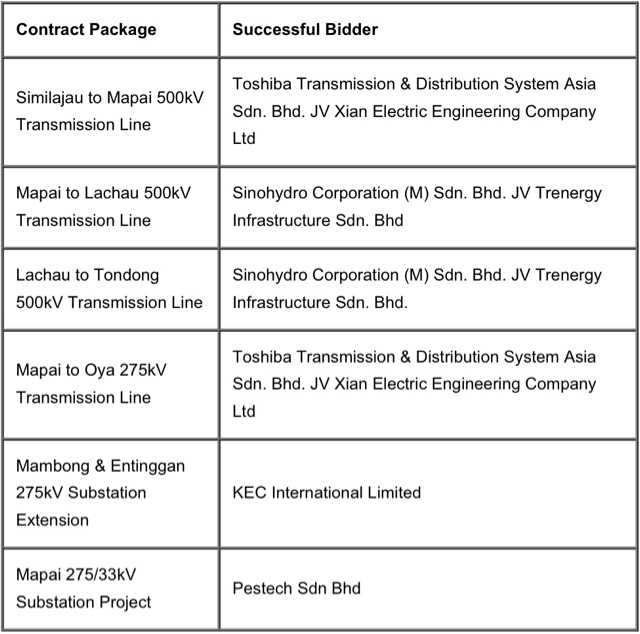 Sarawak Energy Berhad (SEB) awarded six contracts packages worth total of RM1.2 billion for the 500kV Transmission Backbone project yesterday. Based on the information submitted by successful tenderers, SEB said, over 60 local companies, employing an estimated 30,000 workers, will be involved in the awarded contracts. Better power supply system for Sarawak? The local participation across the six packages is well above 50% the company said. The 500kV project would extend over 500 kilometres from Similajau in Bintulu to Tondong in Kuching. Sarawak Energy said the 500kV transmission backbone project would support the future development of the company's generating system and provide a strong security of supply to the fast-expanding Sarawak Corridor of Renewal Energy (SCORE) customers. TheGreenMechanics: Sarawak is a big state and the high voltage transmission lines can not only carry more power, but they also have lower losses. High voltage lines of max 500kV (so far) is used by TNB in West Malaysia.